Kimberly Clausing is the Thormund Miller and Walter Mintz Professor of Economics at Reed College, where she teaches international trade, international finance, and public finance. Her research studies the taxation of multinational firms. 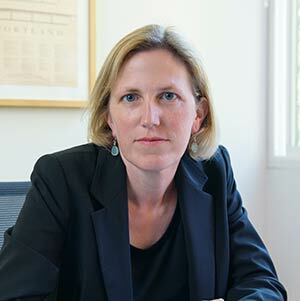 She has published numerous articles in this area, and she is the author of Open: The Progressive Case for Free Trade, Immigration, and Global Capital, forthcoming early 2019 from Harvard University Press. Professor Clausing has received two Fulbright Research awards (to Belgium and Cyprus), and her research has been supported by external grants from the National Science Foundation, the Smith Richardson Foundation, the International Centre for Tax and Development, the U.S. Bureau of Economic Analysis, and the Washington Center for Equitable Growth. She has worked on economic policy research with the International Monetary Fund, the Hamilton Project, the Brookings Institution, and the Tax Policy Center, and she has testified before both the House Ways and Means Committee and the Senate Committee on Finance. Professor Clausing received her B.A. from Carleton College in 1991 and her Ph.D. from Harvard University in 1996.